The Loud Cry of A Perpetual Motionist. Is He a Crackpot or genius? .....It is fascinating to research the life and works of several prominent perpetual motionists. Many of them were Jesuits and were inclined towards spirituality. Their reflections on perpetual motion are great asset to the synthesis of science and religion. 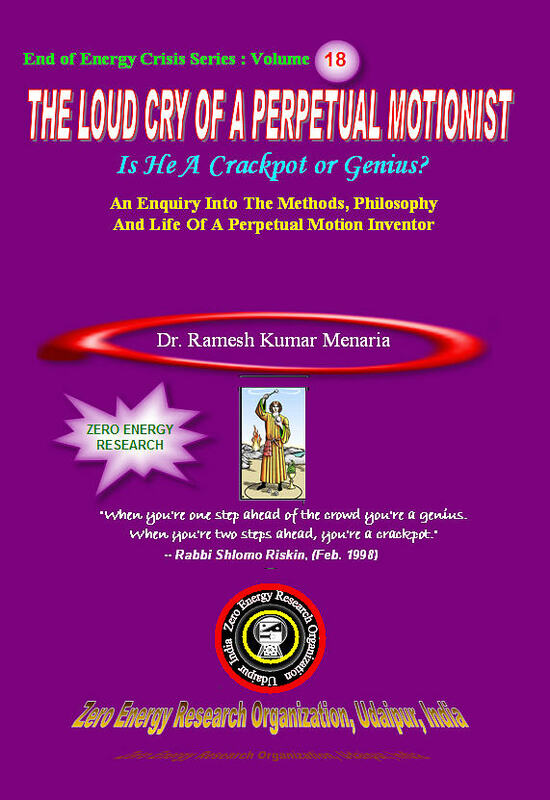 Many perpetual motion inventors know the art of creating unlimited power from nothing, however close connection between spirituality and perpetual motion is still not widely known to these materialistic perpetual motionists. Deva Ramananda thought rigorously how to incorporate Vedic principles into the structure of perpetual motion. He firmly believed that great inventions and discoveries that can transform civilization into the next order are almost impossible without divine inspiration. He called upon perpetual motionists to follow philosophy and actions of Vedic perpetual motionists for the welfare of the society. He also advocated advancement of perpetual motion must be accompanied by a multi-disciplinary approach incorporating many fields such as biology, technology, cybernetics, pneumatics, hydraulics etc. 2 WHO IS A PERPETUAL MOTIONIST? 6 PERPETUAL MOTION ART OR SCIENCE? 10 WHY PHYSICIST RIDICULES “PERPETUAL MOTION”? More About The History Of Perpetual Motion, Over Balancing Wheel And Its Impact On Development Of Mechanics. Perpetual Motion Is Not A Philosophy, It Is An Existential Experience.